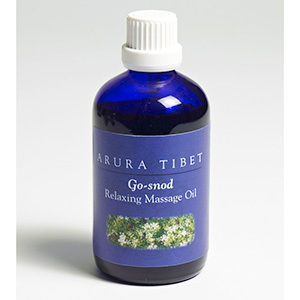 Arura Tibet Go-snod Relaxing Massage Oil is based on Tibetan medicine. In Tibetan medicine it is called Ku-nye. Ku means apply and nye means massage. Massage is especially beneficial for Loong disorders such as dry skin, sleep problems, the overuse of the mind and for treating physical exhaustion. 	Sesame oil - ( Til ) warming oil which helps relieve Loong imbalance and restores vitality. Therapeutic properties are that it contains high levels of minerals, including calcium and magnesium, both renowned for soothing the nervous system. 	Apricot kernel oil ( Kham -bu ) is good for sensitive, dry skin and also has excellent skin softening qualities. 	Nutmeg ( Zati ) - used to pacify Loong imbalance and to treat heart disease. Therapeutic properties are that it is a muscle relaxant and analgesic. 	Frankincense (spos dkar )- to treat arthritis. Therapeutic properties are that it is an anti-inflammatory, it is calming and it uplifts your spirits. 	Gulab attar is a co-distillation of rose and white sandalwood. 	White Sandalwood (Tsan then kar po) is a cooling oil that treats fever in the heart and the lungs. Therapeutic properties are that it calms the restless body and soothes the nervous system. 	Rose is an anti-depressant and anti-inflammatory. 	Caraway oil (Go-sNod ) used for eye disease and treats fever in the heart. Therapeutic properties are that it is an antioxidant, hypoglycaemic and an antibacterial. 	Ylang ylang reduces blood pressure and anxiety. It also helps you to relax. INDREDIENTS - Sesamum indicum (sesame oil), Prunus Armeniaca Kernel oil (apricot kernel oil), Myristica fragrans (nutmeg powder),Boswellia thurifera (frankincense essential oil), Santalum album (white sandalwood oil), Rosa damascena ( rose flower oil ) Carum carvi ( caraway essential oil ), Cananga odorata (ylang ylang flower essential oil ). * limonene, *Citronellol , *Eugenol, *Fernesol, *Geraniol, *Benzyl Benzoate, *Benzyl Salicylate, *Isoeugenol, *Linalool - Chemical constituents naturally occurring in the essential oils. Directions - Shake well, warm your palms, pour a little oil onto your palm and massage gently on the selected points of loong - the crown of the head, two temples, sternum, two palms, two soles of the feet and also the rest of the body. Benefits - calms and relaxes the mind and body.